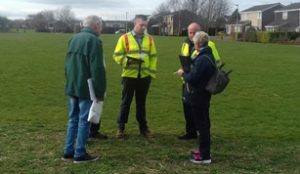 Representatives of Cramlington Town Council were invited to join members of Southfield Resident Association on a walkabout of Southfield Lea. It is hoped that this will become a regular occurrence with the aim of highlighting to the town council issues that are concerning the local residents. Areas looked at included the overhanging trees and poor lighting around the footpath entrance to Southfield Lea. There are problems with garden waste being placed in Valley Park and the state of the garage blocks was also a topic for discussion. The placing of picnic tables in Valley Park was addressed as was the hope to have litter picks involving local residents. Cramlington Town Council will refer to Northumberland County Council any issues that fall within their remit. Pictured: Southfield Residents Association members and representatives from Cramlington Town Council during the walkabout.